As the traditional concepts of work, worker and workplace are rapidly transformed by technology, and employees increasingly look for meaningful work experiences, employers are being challenged to put more than just money on the table to motivate and engage human capital, while delivering value to their companies. Organised by Classified Post to offer timely, high-level insights on the theme of “Rewards and Wellness: Better Ways for Motivation and Engagement”, the latest full-day HR Conference featured a distinguished line-up of keynote speakers, representing start-up enterprises, multinational organisations, academia and HR consultants who offered viewpoints on the key compensation and benefits development and trends, frequently referred to as “total rewards” programmes. Speakers with extensive human capital management experience revealed different ways HR practitioners and the organisations they work for can structure personalised rewards strategies and programmes to attract, engage and retain top talent. The experts also offered suggestions about the different ways changes in reward programmes can be implemented, how to measure the value of investments made in such programmes and how to communicate the total rewards benefits to employees. 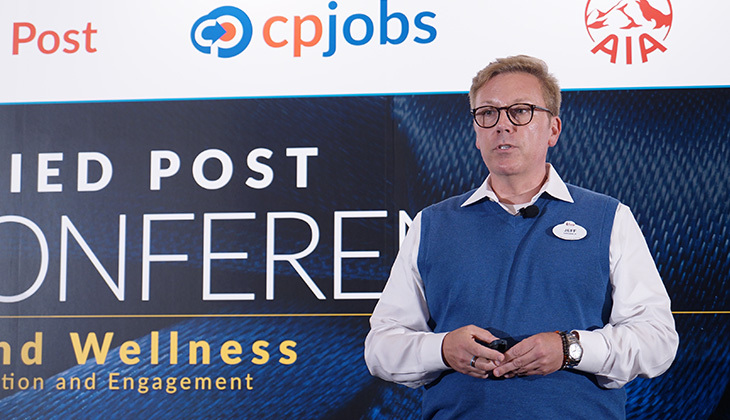 Attendees at the conference, held on 29 June at the Hyatt Regency Hong Kong Hotel, Tsim Sha Tsui, learned how organisations tailor their total rewards programmes to nurture an employer-of-choice culture and reinforce employee-centric values. During his welcome remarks, Alex Ho, general manager, recruitment, circulation, syndication business at South China Morning Post Publishers said that, to further the growth of HR in Hong Kong, Classified Post is proud to bring together a variety of experts to share insights, best practices and the latest research findings. “It’s rewarding to see the Classified Post HR Conference serve as an effective platform for facilitating and encouraging knowledge exchange among HR practitioners from both the employer and recruiter sides,” Ho said. Citing a Talent Shortage Survey conducted by the talent management consultant firm Manpower, Ho highlighted how employers globally are struggling to fill job positions, particularly in the areas of IT personnel, sales representatives and engineers. Hong Kong is number 4 among 43 economies that are encountering difficulty filling jobs. “This is why companies and staff are paying more attention to fringe benefits such as medical insurance coverage, over time compensation, annual leave entitlement, training opportunities and career development,” Ho said. He added that, as an active stakeholder in Hong Kong’s HR community, Classified Post and cpjobs.com will continue to bring inspiring people together at events like the HR Conference to ensure that Hong Kong’s HR community is equipped to meet the full spectrum of recruitment requirements. Following the opening remarks made by Dr Law Chi-kwong, Hong Kong’s Secretary for Labour and Welfare, who outlined the government’s review of employee long-service payments, Royston Tan, head of health and benefits at Willis Towers Watson (WTW), Hong Kong made the first keynote presentation of the day focusing on a road map for modernising benefits. Tan began by outlining how WTW research indicates employers around the Asia region, including Hong Kong, intend to offer more freedom of choice around their benefits by 2019. “This opens the way to custom-build and personalise pay and rewards programmes according to the lifestyle choices and life-stage needs of employees,” Tan explained. However, he added, to ensure rewards programmes provide the maximum benefits to both employees and to the employer through uplifted engagement, motivation and loyalty, employers should adopt total rewards benefits programmes include financial, physical, emotional and social well-being. Hayly Leung, general manager, HR Services, Group HR, Jardine Matheson, one of Hong Kong’s original trading houses, with 22 companies employing about 440,000 people, presented the first case study of the day by explaining how the conglomerate has modernised its employee rewards and benefits programmes. “We have employees representing several generations working side-by-side looking from different things from their rewards and benefits,” Leung said. While salary and work-life balance are the top two priorities employees are looking for based on recent survey done by Randstad, Jardines have built a framework of total rewards not only salary, bonuses, retirement, healthcare but well-being, career and professional development, talent mobility. “One size definitely doesn’t fit all, so we look for innovative ways to provide choices” Leung said. Delivering the second case study of the morning, Sum Wong, CEO and co-founder of start-up firm EventXtra, a one-stop corporate event registration platform, explained that, as an agile enterprise, EventXtra constantly explores different ways to engage and motive employees. For example, sharing company success with performance-incentivised cash bonuses, which to achieve, requires individual performance, teamwork and cross-department collaboration. “This helps to make employees aggressive, in a good way,” Wong said, who added that EventXtra makes every effort to nurture an inclusive “all for one” workplace culture. “Small successes are shared on a daily and weekly basis, instead of saving them up,” he said. To promote career growth, the company has set up a growth fund which sponsors staff to attend conferences, seminars and training events. Wong explained that the company, in the belief that progress equals happiness, had established a matrix measuring system that highlights the contribution teams and departments make to the business’ overall success. Bringing the morning session to a close, during a panel discussion entitled “Beyond Compensation: Challenges and Steps to a Better Reward System”, moderated by Dr Tim Carey, professional consultant at the Chinese University of Hong Kong (CUHK), the three morning speakers discussed ways of how to measure the impact of total rewards programmes and answered audience questions. Starting with a high point for the afternoon session, Jeff Williford, senior facilitator at Disney Institute, stressed the importance of recognising the individual achievements of Disney employees, referred to as “cast members,” which ensures that members of staff working behind the scenes and fast-food servers have a “role” in the show. “Take care of your employees and they will take care of your guests,” Williford said. In the same way that Disney focuses on providing visitors to its theme parks with an exceptional experience, ensuring the employee experience is motivating is vitally important. For example, Williford said taking the time to acknowledge and praise commitment and diligence can boost an individual’s self-esteem. “Never underestimate the benefits of a leader taking an interest in their employees’ achievements,” noted Williford. Dr Tim Carey, who moderated the morning panel session, returned to give the afternoon keynote presentation, on the challenge of formulating benefits for millennials. He said that there is often a gap between career expectations and reality when dealing with this generation, which is defined by its generalised characteristics of independence self-reliance, and resourcefulness. Using multiple sources of research, Carey said employers need to be as open and flexible as possible when managing millennials, while recognising that the time they spend using smartphones is often productive. “If they want to use their phones for a whole morning, it’s okay, let them,” advised Carey, who added that smartphones are the modern mobile equivalent of the office. He also offered an insight to employers and HR practitioners about managing the youngest generation of employees. “If we try to manage millennials the way we managed the past few generations, it probably won’t work,” cautioned Carey. What would happen if we didn’t have to go to college?